Southend are at the risk of missing out on the play-offs because of poor set-piece defending, says boss Phil Brown. The Shrimpers were undone by two set-plays in Tuesday's 2-0 Bradford loss. "I think there's a little bit of confusion within the ranks about what style we play. I can't have that. My job now is to get clarity," said Brown. "We've still got a great opportunity this year. But at the end of the day we're losing it with set-pieces, nothing else." Brown's side, who also lost 1-0 to Scunthorpe on Saturday after a goal from a corner, are three points off the League One play-off places despite the defeat, having been promoted from League Two last year. But Brown continued to BBC Essex: "When you're not playing so well you've still got to grind out results and that's what we didn't do on Saturday or Tuesday - that's what you've seen from Bradford and Scunthorpe. 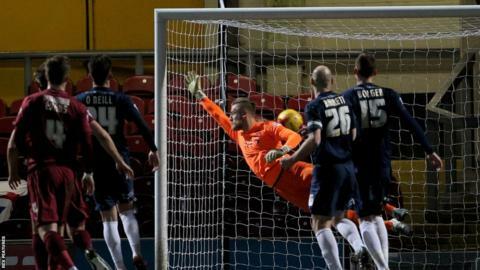 "Has it been a good first 31 games for Southend United? Yeah, it's been OK. But the bottom line is we're losing the race for the play-offs and we've got to seriously think about arresting the situation and that comes against Burton on Monday. "If we don't defend set-pieces properly, you can forget about all the good play, all the intricate passing, the systems, the personnel - we've got to have the right mentality when it comes down to corners, wide free-kicks and even free-kicks in front of goal. "Whether we are a good football team or not doesn't matter to me, it's about winning. "If you think you're a good footballer and you get dispossessed or pick the wrong pass out you're not a good footballer - we've got to get that clarity back into everyone in the ranks, not just the first 11."